Happy Friday! Sorry for being a bit quiet this week, I was having a "me" time, but here I am with a very special post! I'm glad to know the new collection of one of my favorite stores: Aquamar Rio, this place is beautiful and the attendants are very friendly. The fall/winter preview has a 70's chic vibe. I am in love with this long dress with mix of prints and I chose 2 colors! In addition, there's a new Aquamar store located in Soho, New York! Feliz sexta feira! Desculpa por ficar um pouco quieta essa semana, estava cuidando um pouco de mim, mas aqui estou com um post muito especial! Fiquei feliz em conhecer a nova coleção de uma das minhas lojas favoritas: Aquamar, este lugar é lindo e as atendentes são muito atenciosas. A prévia outono/inverno tem um toque anos 70 chique. Estou apaixonada por este vestido longo com mix de estampas e escolhi 2 cores! Such gorgeous dresses for summer! 70s is completely in at the moment. I have to admit, I definitely prefer the blue pattern to the red one. But it's personal choice and I think you rock both really well! The blue dress looks beautiful on you and elongates your body. Those dresses are so lovely and you are really looking gorgeous in them too dear.Nice day. São lindos, meu favorito foi o azul, amo azul! Great selection of maxis - they are all adorable! What a beautiful dress! I love the first color combination the most! I love long dresses, you look beautiful! Both dresses are super gorgeous and look great on you! Those dresses are so pretty! You look great in them! Those are really pretty maxi dresses. I love the blue one. Love this dress and I can't decide which color I like more because they are both stunning!! You look beautiful, Jess! Beautiful dresses! You look stunning! Esses vestidos são fofos e parecem muito confortáveis. What gorgeous dresses! You look like a model! That's a gorgeous dress!! It looks beautiful on you! I love the dresses, I prefer the purple, it is so pretty! oooh the dresses are very pretty! Ameei os vestidos, ótima escolha! Fica até difícil escolher uma cor, os dois estão lindíssimos. Gorgeous dresses, pretty for the summer! The dress is amazingly. Love it. Thank you so much for comment:). Vestidos lindo mais pela cor o primeiro estar show. these dresses are really flattering on you. I can't decide which color I like best - great dress!! This is such a wonderful and feminine dress. You look gorgeous. I agree with you it is a beautiful dress perfect summer my favorite is blue, good weekend! Love the dresses, both such great versatile colors! Both colors are lovely Jessica; you look beautiful. Que vestido lindo e divino. Amo a loja e suas roupas são maravilhosas. you look amazing! cool dress!! !Love your blog, would you like to follow each other? You look gorgeous dear Jessica!!! Liiindos! Ambas as cores são lindas, não consegui decidir meu preferido rs. Os vestidos são lindos nas duas cores mas preferi o marrom, já quero! Stunning dresses, both looks totally gorg on you. you look great darling ! The color pallete is great for this time of the year ! I can't decide which one I like more. Ahhhh que linda, gente! ♥ Eu amo longos. This looks so gorgeous, what an amazing unique print. That dress is so gorgeous! You look fabulous! Lovely dress!!! you are so pretty!!! Beautiful outfit for a summer or spring day. Definitly lovely! These dresses look fantastic on you! I really like your both maxi dresses! Nossa, que lindo esse azul! I like both colors. I love maxi dresses and 70's inspired fashion. Oh my! What a lovely dresses. They are both beautiful, but I think I'll go with the blue one. 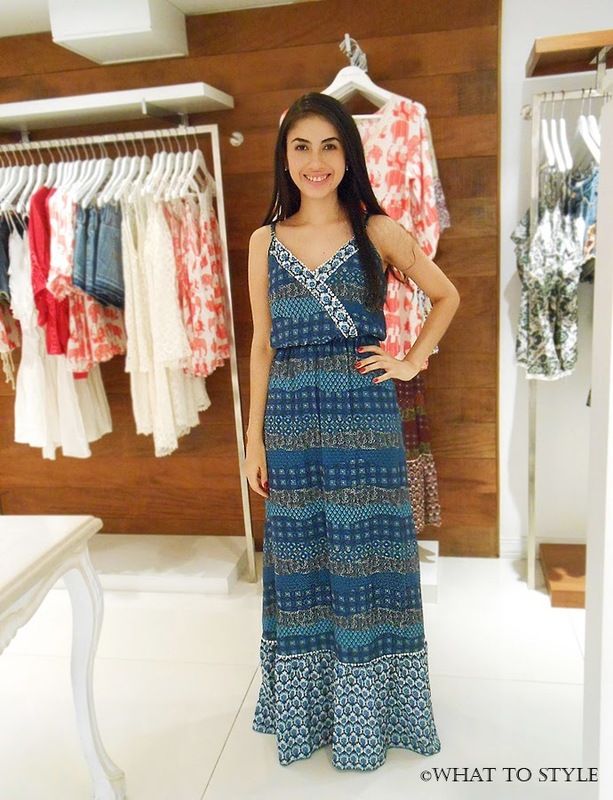 You look absolutely lovely in these printed maxi dresses, especially the blue piece! Gorgeous designs! pretty dress, I like the blue one! Azul é mais lindo <33 ameeeei! This dress is so pretty, I love the blue version!! Gosto muito deste tipo de vestidos. São os dois giros. You look great and I love the first option. I know the feeling of me time. Some days I just do the same. Thanks for sharing. the blue dress is so chic! Super lindo esse vestido Jessica, nem sei escolher qual a minha cor preferida! Beautiful! Loving the length and color options. Oi Jéssica que lindo esse vestido ficou maravilhoso em você! This is such a beautiful dress - the fit and print are both spectacular. I'm so looking forward to the warmer weather here in the UK! Olá! Sou leitora do seu blog e recentemente fui indicada para responder uma tag que se chama "De tudo um pouco"! Eu deveria indicar 11 blogs para respoder a tag também! Eu indiquei seu blog também! Espero que goste da tag! Se puder participar será muito legal!! You look gorgeous! Love the blue especially. I love these dresses so lovely! Girl you look stunning in these dresses! You should post more photos of yourself! Lindos os vestidos! Amo o estilo dessa época, escolheria o azul pra mim. Tenha uma semana abençoada, beijos! Te vez tan Preciosa esos vestidos te quedan tan lindos!